It looks like a toy some child let fall overboard while on a ship in the ocean, but the Rossia pacifica (known as the stubby squid) is entirely real and the video is here to prove it. 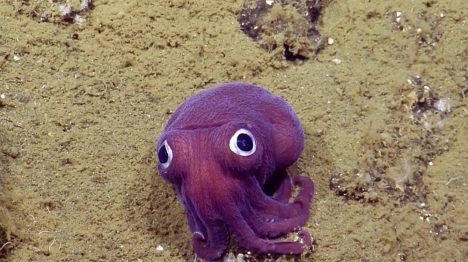 Spotted by E/V Nautilus off the coast of California at a depth of nearly 3,000 feet, the strange creature looks surreal, like some manufactured object or painted anime character. “This species spends life on the seafloor,” say the spotting researchers, “activating a sticky mucus jacket and burrowing into the sediment to camouflage, leaving their eyes poking out to spot prey like shrimp and small fish.” It may not be a Pokemon, but it does stir a certain urge to want to start collecting these exotic critters … or at least start capturing them in close-up, high-resolution, and well-lit videos like the one above. See more in Earth & Nature or under Science. October, 2016.